Listener determines the least busy dispatcher address and passes it back to the client. Client disconnects from listener and connects to dispatcher. PMON registers connection information with the listener. Dispatcher places client request on request queue. Shared server gets request from request queue, connects to database, processes client request. Shared server places response on response queue. Dispatcher returns result to client. Connection pooling gives Oracle Shared Server the ability to handle a larger volume of connections by automatically disconnecting idle connections and using the idle connection to service an incoming client request. If the idle connection becomes active again, the connection to the dispatchers is automatically reestablished. 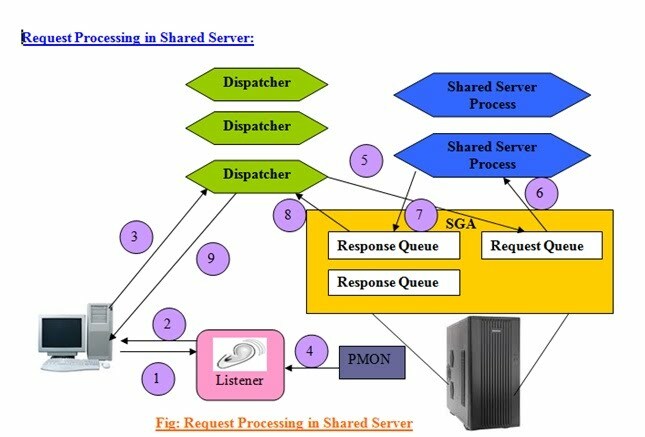 This provides added scalability to Oracle Shared Server. If you manage applications that have a large number of possible client connections but also have a large number of idle connections, you might want to consider configuring this Oracle Shared Server option. Web applications are good candidates for connection pooling because they are typically composed of a large client base with small numbers of concurrent connections. The DISPATCHERS and CONNECTIONS attributes do not have to be specified, since the default for DISPATCHERS is 1 and the default for CONNECTIONS is the maximum number of connections for each process, which is operating system dependent.